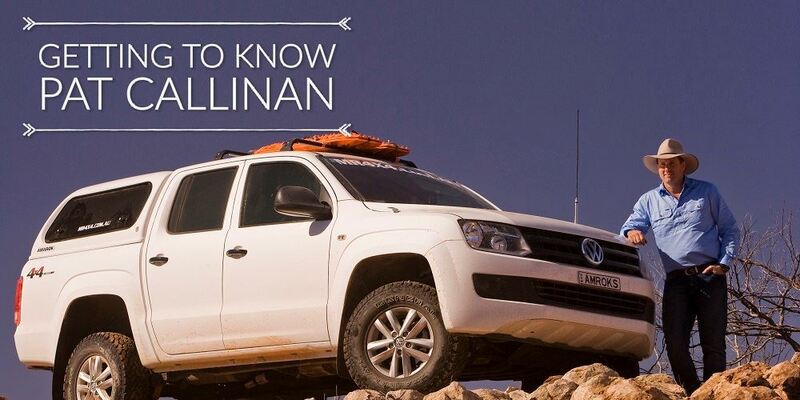 You've seen him on Network 10's Pat Callinan's 4x4 Adventures, and read his magazines, 4x4 Adventures, Unsealed and RV Daily, Pat Callinan or "Mr4x4" as is his moniker is no stranger to being in the spotlight. Since 2006, the media behemoth continues to go from strength to strength, with Pat Callinan professing that Pat Callinan Media is the most respected content publisher in the 4X4 industry today. With the simple aim to be the highest quality publishers of content in the 4x4 and touring industry, there's no stopping Mr. 4X4. But who is the person behind the brand? What makes Pat tick? Ever the charismatic gentleman, we sat down with Pat and found out. 1. You’ve been in the TV and media game for a long time, What do you think sets you apart? I’ve got a passion for what I do. I love four-wheel driving, and I love the media in all of its flavours, from digital television to print. It’s that age-old chestnut – if you love what you do, it’s not really work! And perhaps that shines through in what we do. 2. With a TV show, and three publications (4x4, Unsealed and RV Daily), how do you keep up with it all? Hey, you forgot the insurance company, Club 4X4! Ha ha. I’ve been lucky enough to surround myself with colleagues that I’m proud to call my mates. We’re all pretty similar in terms of drive, and each of us brings something else to the party in terms of skills. So while we’re getting bigger, I’m trying not to work too much harder. 3. What’s the best aspect of your job and what is the hardest? I still get no greater kick out of talking to our TV viewers when they tell me that I inspired them to get into four-wheel driving and outback travel. It dead set gives me shivers down my spine – always has, always will. I never set out to change people’s lives, but it seems I have to some. The hardest part of my job? Choosing where to go each year! It’s such a brilliant country, but the choices are painful! 4. You released a comprehensive camp cookbook 3 years ago, what is your favourite camp meal? 5. What is your favourite destination? C’mon, that’s like choosing your favourite child! Not fair! Tasmania is actually No.1 these days, even out of season when the tourists all go home. Followed closely by the Kimberley’s. Hang on, can I throw the Victorian High Country in there too? 6. What things should I consider for my first trip 4wd trip? Do a 4X4 Driver Training Course. Compared to the price of your 4X4 it’s a cheap price to pay to learn how to use it properly. But certainly, a tyre pressure gauge, a shovel and a recovery kit are right up there too. 7. What are your top three gadgets you have installed in your vehicle? My ARB fridge (camping is now civilised! ), my HEMA Navigator and of course my Redarc BCDC In-Vehicle Battery Charger, cause without it, my fridge doesn't run! 8. What do you like listening to on the drive? I’m a bit of a country music tragic. Not so much the old stuff, but the more modern songs. Aussie, American – I don’t mind. As long as someone’s truck is stuck, they’re missing their baby or it’s time to get a gun (Miranda Lambert), then I’m happy. 9. How do you unwind after a hard day of filming? Give me a comfy camp chair, some cheese and bickies, a nice sunset and a Cooper’s Green and I’m in paradise. 10. We’ve been working together now for many years, what do you feel makes this partnership so successful? I like to think that we both respect what each other is trying to achieve, and we communicate our needs really well. Personally, I also find Redarc extremely inspiring. As a business owner, you like to look at like-minded businesses in your own industry for inspiration. Redarc’s professionalism, integrity, engineering prowess and dedication to excellence is something to be admired. I often use Redarc as an example to my staff as to how a business can be run. And when you respect a company like that, the partnership comes naturally. You can catch Pat, on Pat Callinan's 4X4 Adventures Sunday on channel 10 and repeated on ONE. Click here to find out more about Pat Callinan's publications.